On Fraser Island, February to April is our migratory bird season and, during this time, we welcome our transient bird population who, as part of their migratory pattern, fly north for the winter and then flock back in the summer and spring to feast on the island's abundant supply of crabs, worms and crustaceans. Some 354 species of birds have been officially sighted on the island and in the resort grounds. You may not know that parts of World Heritage-listed Fraser Island (in particular a sand passage estuary that runs between Hervey Bay and Fraser Island) are listed as a Ramsar wetland site – which is essentially a site of international importance, often because of the plant species that are there, and because of the protected migratory birds that can be seen inhabiting those wetlands. A lot of the shorebirds we see on Fraser Island are migratory and 18 of them are actually listed under international migratory bird conservation agreements. With this in mind we always encourage our resort guests and Junior Eco Rangers to take care not to disturb nests and to observe signs when walking near wetlands. This month we're pleased to report that we have spotted several of our shorebird species - including Herons and Egrets – when we’ve been out on our Ranger-guided beach walks. Both species are beautiful to look at and commonly found in wetlands and intertidal mudflats, both of which we have here at the resort. The White-faced Heron (Egretta novaehollindiae - see right) or White-fronted Heron, as it is sometimes called, is easily identified by its height – these birds can grow up to 70cm – and by its pale grey-blue back feathers, long yellow legs and white cheeks. In flight, the dark feathers of the wing contrast with the pale plumage making it easy to spot. When we’ve been out, we’ve spotted our Herons wading along the shoreline or stooping down to dig their beak into the soft sand to pluck out some of the crabs and other tasty morsels like sea snails and exposed yabbies. 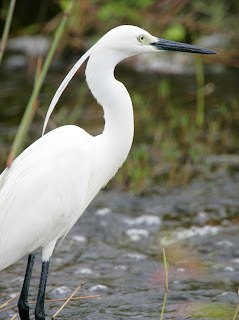 Another fabulous shorebird, the Little Egret (Egretta garzetta - pictured below), is a small, nomadic bird that has wide distribution across eastern and south-eastern Australia and, on Fraser, is commonly found hunting from a perch in a mangrove tree near Kingfisher Bay Resort. Little Egrets are slightly smaller than the Herons and grow between 56 and 65 centimetres tall. As you'll see from our photo, these birds are almost completely white, except for their dark grey-black legs and black bill with yellow colouring on either side of the bill. Interestingly, in the breeding season their plumage is abundant on the back and breast and includes two ribbon-like head plumes. On Fraser Island we also see the large, thick-set Beach Stone Curlews (Esacus neglectus) waders from time to time and April was no exception. This particular species is listed as vulnerable in Queensland (Nature Conservation Act 1992) and has one of the strongest beaks out of all the shorebirds, which allows them to easily crush crab shells and prize open bivalves (i.e. oysters, mussels, scallops). Beach Stone Curlews are usually found solitarily or in pairs and need a runway and a good run in order to take off in flight At high tide they can be found roosting around mangroves or in the shade of trees - their habitat is marine tidal zones, which fits the western coast of Fraser Island to a tee. We haven’t seen their chicks or nests yet, but suspect there is bound to be quite a few on the western side of Fraser - so we'll keep you posted. Well as you've read, it’s been a great much for bird watching on Fraser – stay tuned to find out what we spot next month. Happy twitching. As the sun dips below the horizon on another autumn Fraser day, all sorts of wonderful creatures go about their business in the bushland surrounding the resort. The diversity of the island’s habitat supports a wide range of animals including many nocturnal species. Nothing upsets this little Pacific Black Duck! At the moment Black Flying Foxes (Pteropus alecto) are commuting nightly to Fraser Island from daytime roosts in Hervey Bay and at the mouth of the Mary River on the mainland; and our Villa guests are starting to see our resident marsupials – the Sugar Glider (Petaurus breviceps) and Squirrel Gliders (P.norfolcensis) and the smallest gliding marsupials in the world – the Feathertail Gliders (Acrobates pygmaeus) – gliding between the branches and treetops in search of nectar and insects. We expect to see more of these little guys on our Ranger-guided autumn night walks. 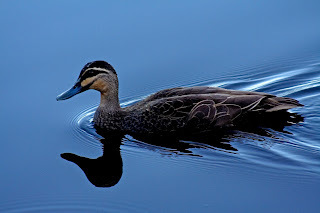 This month two of our regular resort visitors – in the form of Pacific Black Ducks (Anas superciliosa) - have returned to their Wallum Wetlands (just a stone’s throw from Kingfisher Bay’s Centre Complex) after an absence of several months. These birds have a fairly dull brown appearance with some mottling on their side and chest, but have vivid splashes of colour on a spot on the side of their wings called a speculum (see right). If you watch as these ducks move, the wing colours switch from a dull brown to purple to vivid green and back to brown. This is due to the way their feathers interlock, which in turn reflects different wavelengths of light. All birds need to preen themselves, using their beak to rearrange their feathers and keep them orderly. 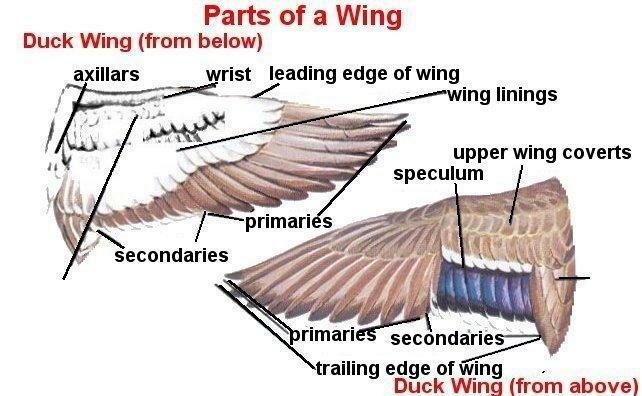 DID YOU KNOW that it is essential for ducks to preen and keep their feathers not only orderly, but watertight? If they don’t, they could drown under their own body weight! Whilst spiders aren’t everybody’s cup of tea, there’s no doubt that intricate spider webs glistening in the moonlight are a thing of beauty. At night time, our harmless Net-casting spiders (Deinopis sp) spin small, pretty made of thick, bluish-white cribellate* silk in bushland nooks – which we sometimes spot on our guided night walks or with our Junior Eco Rangers. Net-casting spiders can be found along the east coast of Australia in a wide variety of habitats and have a really interesting way of ambush hunting. At night, these stick-like spiders build rectangular webs (about the size of a postage stamp) and deposit spots of white faeces on the surface to act as aiming spots. The spider then hangs from a thread of silk, holding the net in its front pairs of legs and waits patiently for its dinner (see picture below). When unsuspecting insects fly into the web, the spiders - which are super-sensitive to any movement in their web - rush over, break a strand off their web and wrap it securely around their prey. Often, whilst eating their dinner, the spider starts building a new net for its next meal. These spiders have extremely good night vision and can concentrate available light more efficiently than owls or domestic cats making them extremely good predators in the night-time environment. Speaking of the environment, there are many who read our blogs who care a lot about the conservation and the effects of climate change on sea levels and global fauna and flora. As a developed society, the amount of energy we use is of concern. Kingfisher Bay Resort's vision since opening has been to educate staff, guests and regional district – from schools through to townsfolk – about the environment and our impact upon it... so we joined the global Earth Hour community on March 23 to show what one simple idea can achieve and one person's actions can inspire. Catch you next time, tree huggers... and if you have any fabulous flora or fauna shots that you've snapped on Fraser Island, we'd love to see them on our Facebook or Instagram pages. And, if you're interested to know more about island life, check out our Life on Fraser blog. *A small sieve-like spinning organ in certain spiders that occurs between the spinnerets.